Draft: 2008, Boston Red Sox, 7th rd. Full name TIMOTHY JOSEPH FEDEROWICZ (\fehd-ah-ROW-vich\)...Wife, Megan... One girl, Emma...Hit .319 with 21 home runs and 125 RBI over his three-year career (2006-08) at the University of North Carolina-Chapel Hill...Ranks sixth all-time at UNC in doubles (57) and ninth in RBI...Reached the College Baseball World Series finals twice in his collegiate career (2006 and 2007) but fell both times to Oregon State... Was a 2006 Freshman All-American and was named to the 2006 All-College World Series team... Was a member of the U.S. National team that won the 2006 FISU World Championship in Havana, Cuba...2005 graduate of Apex High School (NC)...Lived in Erie only eight months, his grandfather still resides there...Favorite team growing up was the Atlanta Braves and his favorite players were Derek Jeter and Chipper Jones. Spent the majority of the season at the Triple-A levels for Houston and Cincinnati and appeared in 15 games at the Major League level for the Astros and Reds...Combined on the year at AAA he batted .297 (63-for-212) with 19 doubles, 7 homers and 31 RBI in 62 games (.372/.486/.858)...Was with the Astros over two stints (May 29-June 7; July 3-25) and elected free agency on July 30 upon being designated by the Astros for the second time ... Signed with Cincinnati on August 2...Promoted to the Major League club after the conclusion of the Minor League season (Sept. 5) and spent the rest of the year with the Reds....Made 5 appearances for the Reds, including his lone start in the final game of the season at Pittsburgh (9/30), during which he hit his only homer (two-run off Clay Holmes)...Reds pitchers posted a 2.65 ERA when he caught (17IP)...Over his seven-year Major League career has thrown out 20 of 71 potential basestealers (28.2%). The veteran backstop had two separate stints with San Francisco, hitting .231 (3x3) with two homers and three RBI in 13 games (one start)...had his contract purchased from Triple A Sacramento on April 11, taking the roster spot of Buster Posey who was placed on the seven-day DL with concussion symptoms...was designated for assignment on April 18 when Posey came off the DL...had his contract purchased from Triple A Sacramento on Sept. 1...hit .300 (85-for-283) with 19 doubles, nine home runs and 43 RBI in 77 games for triple-A Sacramento. Had two stints with the Cubs, April 28-June 17 and from September 6 through the end of the season...went 6-for-31 (.194) with two doubles, three runs scored and three RBI in 17 games with Chicago... also appeared in 65 games with Triple-A Iowa...Batted .293 with 12 doubles, eight homers and 39 RBI in 65 games with Triple-A Iowa...Recorded a 13-game hitting streak with Iowa, April 21-July 9 (with major league call-up in the middle), in which he batted .432 (19-for-44) with six doubles and 10 RBI. Underwent surgery to repair a complete tear of the lateral meniscus in his right knee on March 13 at Scripps Clinic in La Jolla, Calif...Played in a combined 27 rehab games with singleA Fort Wayne and triple-A El Paso, batting .202 (19-for-94) with four homers and nine RBI...Was traded from the Dodgers to the Padres with outfielder Matt Kemp and cash considerations for right-handed pitchers Zach Eflin and Joe Wieland and catcher Yasmani Grandal on December 18, 2014. Spent the majority of the season with Triple-A Albuquerque, hitting .328 with 26 doubles, 14 home runs and 48 RBI in 78 games for the Isotopes…also saw time with the Major League club, playing in 23 games for the Dodgers...Optioned to Albuquerque on 3/21 during Spring Training, beginning the season with the Isotopes before being recalled on 4/8 (after A.J. Ellis had right knee surgery)…optioned back to Albuquerque on 4/30 (in order to clear a spot for C Miguel Olivo)...Recalled a second time on 5/26 after Ellis returned to the DL… optioned back on 6/13 (when Ellis returned from the DL)...Recalled a third and final time in September, spending the remainder of the season with the Dodgers...Started 69 games behind the plate in Triple-A. Made his first Opening Day roster and had four stints for the club, batting .231 (37-for-160) with four homers and 16 RBI in 56 games in his third MLB season... Hit his first career Major League home run on June 1, 2013 in Colorado off Jhoulys Chacin in the third inning... The club went 24-18 in his 42 starts behind the plate... Threw out 9-of-33 (27.3 %) attempted base stealers and posted a catchers' ERA of 3.59...made his first career appearance at first base on July 10 at Arizona, entering the game as a part of a double-switch in the 13th inning, and played two games at first base for a total of three innings in 2013... Finished the season strong, batting .276 (21-for-76) with a homer, four doubles and four RBI in his last 25 games after July 20 (Dodgers, 17-8)... Batted .303 (10-for-33) in 10 games in August... 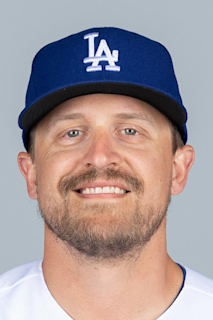 Thrived on the road, posting a .289 (24-for-83) average with three homers, five doubles and 10 RBI in 28 games away from Dodger Stadium... Made the Dodgers' postseason roster for the National League Division and Championship series but did not appear in any games... In 21 games with Triple-A Albuquerque, batted .418 with eight home runs, 25 RBI...had a .500 on-base percentage and an .848 slugging percentage... Was named the Pacific Coast League Player of the Week for April 29-May 5. Appeared in three games with the Dodgers, going 1-for-3 after being called up on Sept. 1...made his only start behind the plate in the Dodgers' season finale on Oct. 3. Selected to the 2012 All-Pacific Coast League team after batting .294 with a team-high 34 doubles (12th, PCL), 11 home runs and 76 RBI in 115 games for the Isotopes. Was the starting catcher for the PCL in the Triple-A All-Star Game, batting .301 with 21 doubles, seven homers and 48 RBI before the All-Star break. Led the PCL in caught-stealing percentage at 39%. Batted .376 (44-for-117) against left-handers with the Isotopes. Had his best month of the season in August, when he batted .345 (30-for-87) with 10 doubles, a homer and 18 RBI in 26 games. Acquired from Boston at the July 31 trade deadline in a four-player deal that also brought the Dodgers minor leaguers Juan Rodriguez and Stephen Fife in exchange for Trayvon Robinson...Recalled by Los Angeles on Sept. 6 and made his Major League debut as a pinchhitter at San Francisco on Sept. 11, striking out in his only at-bat...at the time of his promotion, he was batting .325 with six homers and 17 RBI in 25 games with Triple-A Albuquerque...Made his first big league start on Sept. 15 at Dodger Stadium where he went 1-for-2, singling off Pittsburgh's Russ Ohlendorf for his first Major League hit...Finished the season going 2-for-13 (.154) in seven games, including four starts behind the plate with the Dodgers...Cut down two of five runners attempting to steal (40%) in the Majors...Hit .287 with 14 home runs and 69 RBI to accompany a .357 on-base percentage over a 115 games spent between Albuquerque and Boston's Double-A Portland...matched his career high in homers (14) and set new career bests in RBI (69), runs scored (63), walks (47) and games played (115)...Threw out a combined 33.3% (36-of-108) of would-be minor league base stealers...Named by Baseball America as the Dodgers' best defensive catcher and the organization's 10th-best prospect after the season...third consecutive season of being named an organization's best defensive catcher by the publication. Appeared in a career-high 109 games, all with High-A Salem...Ranked 3rd in the Carolina League with a team-high 34 doubles, tied for the 5th-most among Red Sox minor leaguers...Tied for the CL lead with 12 doubles in May...Collected a career-best 61 RBI, 3rd on the team and tied for 11th in the Sox system...Hit .341 (14-for-41) with 4 doubles, 2 homers and a CL-best 13 RBI during a career-high 10-game hitting streak from 6/8-19...Threw out 30 of 90 (33.3%) attempted base stealers, tied for the 2nd-best percentage among qualifying league catchers...Connected for his 1st career grand slam on 6/8 vs. Lynchburg, tallying a career-best 5 RBI in that game...Landed on the DL due to a right thumb laceration on 8/8...Was activated on 8/22...Following the season, rated as the best defensive catcher in the Red Sox system by Baseball America for the 2nd straight season. Combined to lead Red Sox farmhands with a .305 average (126-for-413) while tallying 14 homers and 58 RBI between Single-A Greenville and High-A Salem...Ranked 5th in the Red Sox farm system in home runs...Began the season with Greenville...Was named a mid-season South Atlantic League All-Star and went 0-for-1 with an RBI in the exhibition, 6/23 in Charleston...Was promoted to Salem on 6/24 as the South Atlantic League's 1st-half batting leader with a .345 average (78-for-226)...Also paced the Drive with 10 homers before the break...Named South Atlantic League Player of the Week for 6/15-21...Hit .529 (9-for-17) with 6 runs, 3 doubles, a home run, 4 RBI and 3 walks in that time...Selected as Red Sox Minor League Defensive Player of the Month for June...After the season, rated as the best defensive catcher in the Red Sox farm system and ranked as the South Atlantic League's No. 15 prospect by Baseball America. Played for Short-A Lowell in his pro debut...Tied for 2nd on the team with 10 stolen bases...Threw out 16 of 49 (41.0%) attempted base stealers Named Red Sox Minor League Defensive Player of the Month for August/September...Hit .250 (3-for-12) in 3 playoff games. February 14, 2019 Cleveland Indians signed free agent C Tim Federowicz to a minor league contract and invited him to spring training. February 14, 2019 C Tim Federowicz assigned to Columbus Clippers. October 3, 2018 C Tim Federowicz elected free agency. October 3, 2018 Cincinnati Reds sent C Tim Federowicz outright to Louisville Bats. September 4, 2018 Cincinnati Reds selected the contract of C Tim Federowicz from Louisville Bats. August 3, 2018 C Tim Federowicz assigned to Louisville Bats. August 2, 2018 Cincinnati Reds signed free agent C Tim Federowicz to a minor league contract. July 30, 2018 C Tim Federowicz elected free agency. July 26, 2018 Houston Astros designated C Tim Federowicz for assignment. July 3, 2018 Houston Astros selected the contract of C Tim Federowicz from Fresno Grizzlies. June 10, 2018 Houston Astros sent C Tim Federowicz outright to Fresno Grizzlies. June 8, 2018 Houston Astros designated C Tim Federowicz for assignment. May 29, 2018 Houston Astros selected the contract of C Tim Federowicz from Fresno Grizzlies. December 11, 2017 Houston Astros signed free agent C Tim Federowicz to a minor league contract and invited him to spring training. December 11, 2017 C Tim Federowicz assigned to Fresno Grizzlies. November 3, 2017 C Tim Federowicz elected free agency. November 3, 2017 San Francisco Giants sent C Tim Federowicz outright to Sacramento River Cats. October 30, 2017 San Francisco Giants designated C Tim Federowicz for assignment. September 1, 2017 San Francisco Giants selected the contract of C Tim Federowicz from Sacramento River Cats. April 21, 2017 San Francisco Giants sent C Tim Federowicz outright to Sacramento River Cats. April 18, 2017 San Francisco Giants designated C Tim Federowicz for assignment. April 11, 2017 San Francisco Giants selected the contract of C Tim Federowicz from Sacramento River Cats. January 6, 2017 C Tim Federowicz assigned to Sacramento River Cats. December 12, 2016 San Francisco Giants signed free agent C Tim Federowicz to a minor league contract. December 12, 2016 C Tim Federowicz roster status changed by San Francisco Giants. November 7, 2016 C Tim Federowicz elected free agency. November 7, 2016 Chicago Cubs sent C Tim Federowicz outright to Iowa Cubs. November 3, 2016 Chicago Cubs activated C Tim Federowicz. October 7, 2016 Chicago Cubs reassigned C Tim Federowicz to the minor leagues. September 6, 2016 Chicago Cubs selected the contract of C Tim Federowicz from Iowa Cubs. June 27, 2016 Chicago Cubs sent C Tim Federowicz outright to Iowa Cubs. June 17, 2016 Chicago Cubs designated C Tim Federowicz for assignment. April 28, 2016 Chicago Cubs selected the contract of C Tim Federowicz from Iowa Cubs. January 20, 2016 C Tim Federowicz assigned to Iowa Cubs. January 14, 2016 Chicago Cubs signed free agent C Tim Federowicz to a minor league contract and invited him to spring training. November 6, 2015 C Tim Federowicz elected free agency. September 28, 2015 El Paso Chihuahuas activated C Tim Federowicz from the 7-day disabled list. August 29, 2015 El Paso Chihuahuas placed C Tim Federowicz on the 7-day disabled list. August 11, 2015 San Diego Padres sent C Tim Federowicz outright to El Paso Chihuahuas. August 1, 2015 San Diego Padres designated C Tim Federowicz for assignment. July 19, 2015 San Diego Padres sent C Tim Federowicz on a rehab assignment to El Paso Chihuahuas. July 12, 2015 San Diego Padres sent C Tim Federowicz on a rehab assignment to Fort Wayne TinCaps. December 18, 2014 Los Angeles Dodgers traded RF Matt Kemp, C Tim Federowicz and cash to San Diego Padres for C Yasmani Grandal, RHP Joe Wieland and RHP Zach Eflin. November 13, 2014 IF Tim Federowicz assigned to Mayos de Navojoa. October 13, 2014 Los Angeles Dodgers activated C Tim Federowicz. October 3, 2014 Los Angeles Dodgers reassigned C Tim Federowicz to the minor leagues. September 1, 2014 Los Angeles Dodgers recalled C Tim Federowicz from Albuquerque Isotopes. June 13, 2014 Los Angeles Dodgers optioned C Tim Federowicz to Albuquerque Isotopes. May 26, 2014 Los Angeles Dodgers recalled Tim Federowicz from Albuquerque Isotopes. May 26, 2014 C Tim Federowicz roster status changed by Albuquerque Isotopes. April 30, 2014 Los Angeles Dodgers optioned C Tim Federowicz to Albuquerque Isotopes. April 8, 2014 Los Angeles Dodgers recalled Tim Federowicz from Albuquerque Isotopes. March 21, 2014 Los Angeles Dodgers optioned C Tim Federowicz to Albuquerque Isotopes. May 30, 2013 Los Angeles Dodgers recalled C Tim Federowicz from Albuquerque Isotopes. May 19, 2013 Los Angeles Dodgers optioned Tim Federowicz to Albuquerque Isotopes. May 8, 2013 Los Angeles Dodgers recalled Tim Federowicz from Albuquerque Isotopes. April 24, 2013 Los Angeles Dodgers optioned Tim Federowicz to Albuquerque Isotopes. April 17, 2013 Los Angeles Dodgers recalled Tim Federowicz from Albuquerque Isotopes. April 10, 2013 Los Angeles Dodgers optioned Tim Federowicz to Albuquerque Isotopes. September 1, 2012 Los Angeles Dodgers recalled C Tim Federowicz from Albuquerque Isotopes. April 4, 2012 Los Angeles Dodgers optioned Tim Federowicz to Albuquerque Isotopes. October 28, 2011 C Tim Federowicz assigned to Tigres del Licey. September 6, 2011 Los Angeles Dodgers selected the contract of Tim Federowicz from Albuquerque Isotopes. July 31, 2011 Los Angeles Dodgers Traded Trayvon Robinson to Boston Red Sox; Portland Sea Dogs Traded C Tim Federowicz and RHP Stephen Fife to Chattanooga Lookouts and Greenville Drive Traded RHP Juan Rodriguez to Great Lakes Loons. April 2, 2011 Tim Federowicz assigned to Portland Sea Dogs from Salem Red Sox. February 2, 2011 Boston Red Sox invited non-roster C Tim Federowicz to spring training. August 22, 2010 Tim Federowicz roster status changed by Salem Red Sox. March 3, 2010 C Tim Federowicz assigned to Boston Red Sox. June 25, 2009 C Tim Federowicz assigned to Salem Red Sox from Greenville Drive.